Harrison looked around at the collective faces. All of the women, Paula included, were giving Wild Feather their rapt attention. Rob was listening too, although probably for another chance to jump in and question Feather’s authority on this subject. As for Greg, judging by the glazed look in his eyes as he peered into the fire, he was in his happy place right now. “What happened?” Paula asked as Wild Feather continued with his dramatic pause. “Once, long ago, before the coming of the white man, when the buffalo were still plentiful on the plain,“ Wild Feather began, “there was a man in the tribe. He was a powerful warrior, one of their fiercest braves. However, he was also prideful. After many victories in battle and countless successful hunts, this man began to boast that he had no equal. He could defeat any man and take his wives and horses. He could kill any beast and claim its flesh and hide. He laughed that the spirits were but smoke to him and he had made far too many fires to be fearful of smoke. “I know what you mean, brother.” Greg chuckled, taking another toke. Wild Feather paused again, making eye contact with Danni, Allison, and Paula, one after the other, as he did so. “Finally the Great Spirit sent one of the hairy men down from the mountains. The beast was already fearsome, but the spirits imbued it further. They made it swift, so that not even the deer could outrun it. They made it strong, so that not even the bear could stand against it. They made it powerful, so that no arrow could piece its hide. Its cries began to be heard in the village when it was still many moons away. The tribe grew fearful as the beast approached, its howls of vengeance growing louder with every passing day. Finally the elders came to the prideful man and pointed at him. This is your fault, they said. The spirits are punishing us all for your wickedness. But the man just laughed and told them, it is just another beast. I have slain the buffalo. I have slain the bear. I will take my bow and arrow and slay too this beast so that I might bring back its fur to warm me by the fire. The next day the prideful man packed up his weapons and set off into the woods to meet the creature face to face.” At that, he stopped telling the story and just stared into the fire. “And then Jason and Michael Myers walked out and slaughtered the campers.” Greg added, laughing at his own joke. “What kind of things?” Harrison asked. I hope you enjoyed this preview! 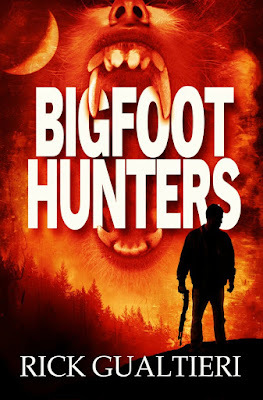 The full novel, BIGFOOT HUNTERS, is available now from Amazon. There was a Bigfoot convention in my town in 2007. They went out hunting Bigfoot. We moved here after that. I'm really disappointed I missed the hunt. It would have been a blast. Hey Rick, first time visitor and great to meet you! Good luck with your book. My kids still believe Big Foot exists. And maybe he does. Its a great topic to keep people engaged. Thank you! I appreciate the offer especially since I'm trying to be a little more verbal in the blog space this year. BigFoot convention eh? I miss all the fun ones. Hey Stephen! Welcome and thanks for the well wishes. I keep an open mind on the subject of Bigfoot. Personally I think that at least 80% of the sightings, evidence etc etc is misidentification, hoaxes, or just plain people not thinking things through. However, it's that remaining 10 or 20% that I find really interesting. So exciting! I LOVE the cover too ;) I'm tweeting this. Thanks, Elisa! You're the best!